These charts explain it all. 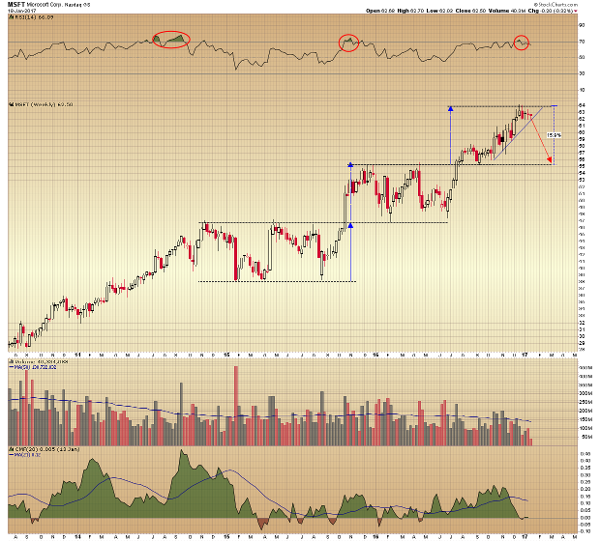 For the last two years, Microsoft (MSFT - Get Report) shares have been moving in a repeating pattern of horizontal channel consolidations followed by measured moves higher. The recent highs have established another channel top, and should be followed by a retest of the channel low. If the pattern repeats, it would be a pullback of approximately 16% (or about a $78 billion hit to Microsoft's market cap) and return shares to the $55 level. The weekly chart shows the November 2014 high and the February 2015 low defining the parameters of a channel that lasted until the stock broke above resistance in October 2015. It rallied approximately 16% over the following two months, making a perfect measured move and establishing the upper boundary of a second channel consolidation range. A measured channel move is a pattern price projection that is defined by taking the height of the channel and adding it to the breakout level to target a price objective. The stock traded within the borders of the second channel until July last year, when it broke above the $55 resistance level and rallied up to the $64 level, which was a 16% advance and another perfect measured move. Tests of previous channel tops have been of short duration and, if the process repeats, the stock should begin to pull back, ultimately testing previous channel resistance-turned-support. This would be a measured retracement and a 16% decline. The relative strength index is in an overbought condition, similar to earlier channel highs. 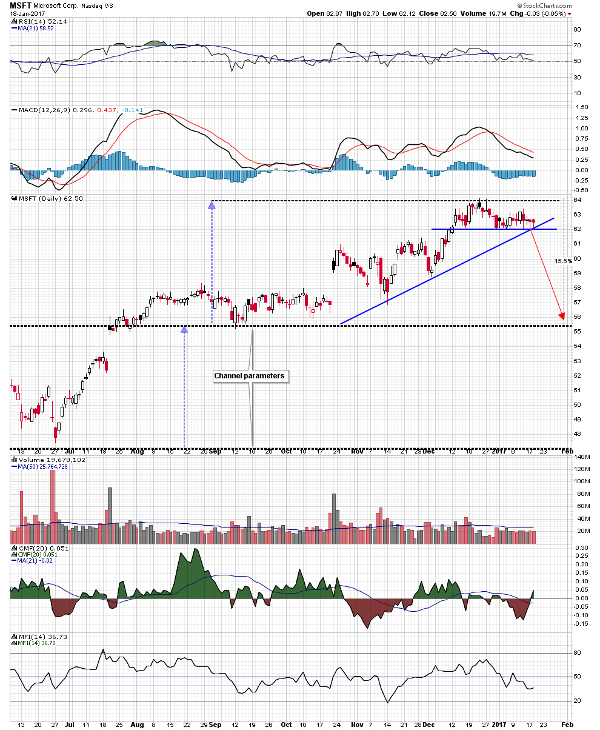 Chaikin money flow suggests that this recent rally is being sold. On the daily time frame, the stock can be seen trading in a narrow range near the top end of the current channel consolidation range, and retesting an uptrend line drawn off the lows since November of last year. The relative strength index has dropped below its 21-period signal average but is holding above its center line, and moving average convergence/divergence has made a bearish crossover and is tracking lower. Chaikin money flow has moved back into positive territory, but the money flow index, a volume-weighted relative strength measure, has dropped below its center line. If the pattern of past price action repeats, a break below the daily intersection of support in the $62 area should be followed by a pullback to the $55 area. A short trade based on this assumption offers good risk/reward using an initial buy-to-cover protective stop placed just above the upper end of the current channel top in the $64 area.